I realize we're already a couple weeks into the new year, however I do believe it's never too late to claim a resolution. I hadn't given much thought to what I'd like to improve upon or change in this new year, but after some thought I finally came up with a reasonable resolution I'd be willing to work towards. I've decided to make an effort to participate in the monthly challenges on Studio Veena. For those of you unfamiliar with Studio Veena, it is an online community for pole dancers. Members can join for free which enables all access to posting online pole videos, community message boards, blogs, and the weekly Friday live video chat with other members- including the creator and owner of the site, Veena herself. Studio Veena also offers a paid membership option where the user has unlimited access to pole lessons twenty four hours a day from beginner to advanced with conditioning, stretching, and foam roller exercises as well as lap/chair and hoop dance lessons. The site is a wonderful resource for those wanting to learn on their own at their own pace or a supplement to their current studio classes. I've been a member since a few months after Studio Veena first launched back in 2008 and have watched the site grow. I've developed close relationships with many other pole dancers all over the world and have even met many of the members in person this past year at events- Veena included. I'm very grateful for all this site has accomplished and the opportunities it has given so many of us in the pole community. 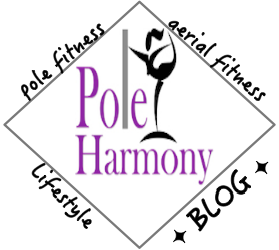 I think it's such an amazing gift what Veena and her husband (who both created and run the site together) have given to the pole community and without it, I don't know where many of us would be in our great love affairs with pole. In addition to feeding your pole addiction, Studio Veena enables members to participate in monthly video challenges. Every month a theme is chosen and members can create a video based on the theme to post on the site. It's a creative and fun activity that allows members to showcase their latest progress in their dancing. In the past I've done a challenge here and there, but this year I'd really like to make an effort to participate on a regular basis. I'm taking on a lot this year with school and teaching more classes which have left me with little time to regularly make videos from all my practices. I'm also getting bored. I'm finding all my videos as of lately have the same moves so I'm hoping by cutting down my videos to one a month, I will be able to find that creativity I feel I've been lacking and the progress of my dancing will be much more evident. So here's to a new year an a new promise to myself for another great year of pole!